I've got Flickr set up to send me email when an image gets a comment or added to someone's favourite page. At some point on Saturday afternoon I started getting lots of messages - and the view count on one picture started going ballistic. From the few hundred views it had garnered over the last three years or so, it was suddenly gaining tens of thousands of views an hour. Strange, I thought, and went back to looking for a decent pair of trousers in an outlet mall near Palm Springs. By evening views and comments were still marching in, so I delved into the delights of the Flickr stats pages to find out just what had happened. As far as I can tell, at some point on Saturday morning, someone found the picture and posted a link to it on Reddit. That then led to it being added to Digg - and then for some reason people kept Digging it - over 2000 Diggs last time I looked. On a slow Saturday that was enough to get it on the front page, and that led to an explosion of traffic. By Saturday night, Flickr was telling me that the picture had had over 60 thousand viewings. By the middle of Sunday, it had attracted well over 100 thousand viewings. I'd heard that Digg drove traffic, but I'd never seen it happen to anyone I'd known before. To put the Digg Effect into perspective, my most popular Flickr image, which had been picked up by popular blogs (including Boing Boing, Engadget and Lifehacker) has only just past the 150 thousand view mark, and that's been over four or so years. The Digg front page has driven around 140 thousand separate people to that image in just over 48 hours - and almost 100 thousand of them came in one 24 hour period. It's late on Monday now, and things are winding down at last. Something else has caught the attention of the Diggerati, and my picture is slowly falling off the zeitgeist radar. It's been an interesting ride to watch. It's actually kind of apt. No one would have seen that picture if it hadn't been for the machine I'd photographed all those years ago, in an acrylic case in a museum at a scientific research establishment on the Swiss-French border. 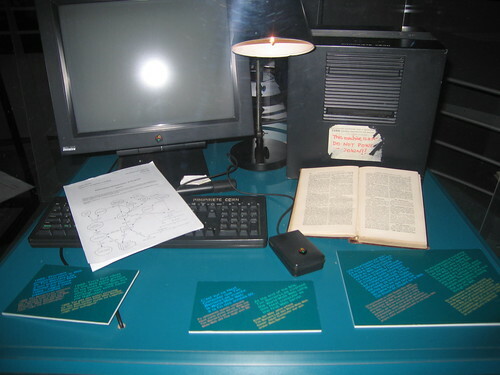 The place was CERN, and the computer I'd photographed was Tim Berners Lee's NeXT Cube, the first ever web server. Neither Flickr, nor Digg (nor this blog) would be here if it hadn't been for that machine and the server it hosted. The internets are soooo self-referential! You know that the first site on the TB-L's world wide web belonged to the SLAC librarian, Louise Addis?